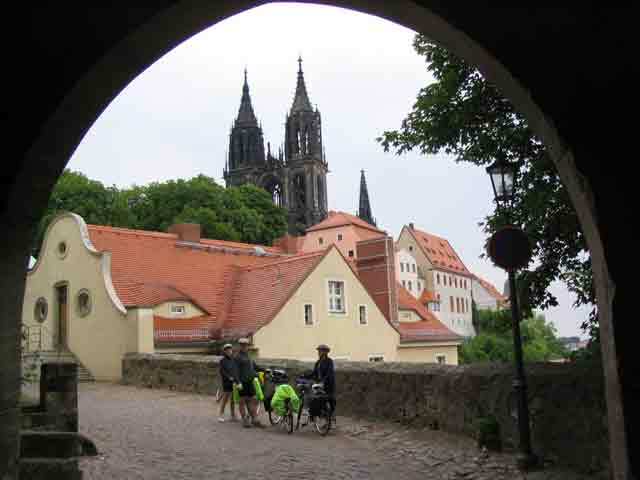 Thinking of taking a bicycling holiday in Germany? Bicycling in Germany is rewarding from both a physical and mental perspective. Germany is bicycle-friendly, more so than most other western European nations. It is as safe or safer than bicycling in any country of which I know in the world. You will find yourself welcome by citizens who frequently go out of their way to be helpful. This page is a broad overview of what you may find when you visit. You will find information about maps, bicycle theft, and some "just riding down the path" impressions. Perhaps most importantly, Germany is simply beautiful. It is a bouquet of mountains, low lands, river valleys, high plateaus, forests, and farms. The mountains include not only the majestic Alps but also a stable of smaller mountain ranges like the Harz, Schwäbische Alb, and Eifel. Germany is dotted by many forests too numerous to name; the most famous might be the Black Forest for example. But the thing that pulls my heartstrings the most is the villages. They frequently are no more than a cluster of white half-timbered buildings with red tile roofs, nestled in valleys or along rivers. This page is a forerunner to the following pages: Trains, Culture, German Food and Drink, German Beer, German Wine, and the City of Kassel, just to name a few. "Although Germany is well-known for its automobiles and speed-limit-free autobahn, it should also be considered a cycling nation as well. There are 40% more bicycles than cars. Two out of five German vacationers take bicycle vacations too. Well over 7,400 miles of dedicated, car-free cycling routes make it an ideal place for vacationers of any age and fitness level. Many routes lead through flat areas or along rivers, cycling is a perfect way to relax and recover. In a week or two you can see and do a lot: celebrate vibrant wine festivals along the Rhine, marvel at hand-made filigree Meissen Porcelain in Dresden, or experience Bavarian traditions and mouth-watering cuisine. "On the other hand, traveling with a guided bike tour is a great and safe way to see the countryside and offers the added benefit of accompanying vans that transport your luggage. Your guide will organize city tours and support you in any matter. 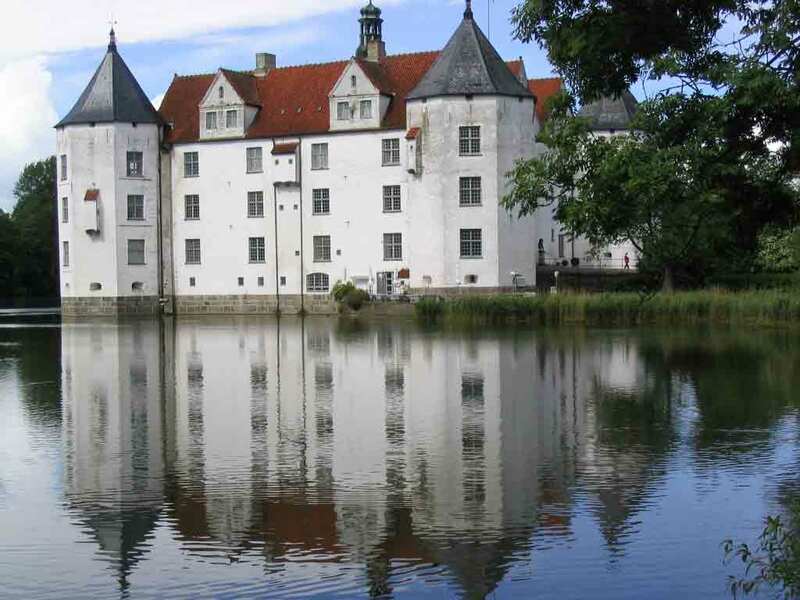 Mercurio-Bike-Travel.com offers some exceptional packages that are easy riding along the rivers such as the Danube, Elbe, Moselle, and Rhine." With press like that, is it any wonder that Andre is one of my favorite people? It would seem that he has said it all but I am guilty of wordiness as anyone who spends any time on our website can tell. So, I need to add a few things to Mr. Volkel's well thought out remarks. Germany is famous for many things besides manufacturing a few automobile brands like Mercedes Benz, VW, Porsche, and BMW. To begin with, there are the things you put in your body, like the many different types of bread available at every grocery store. 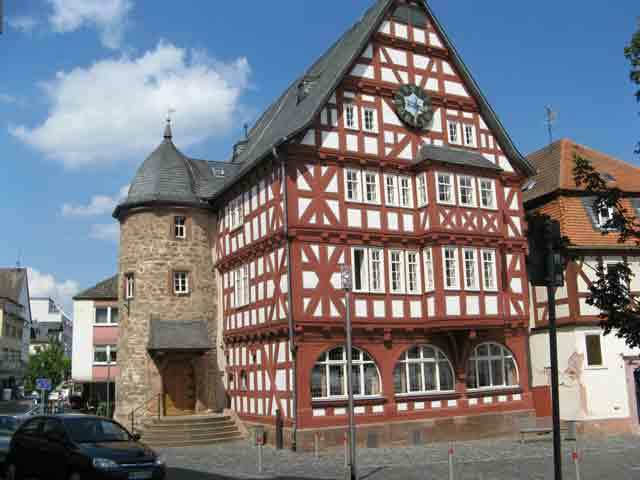 They are a major producer of wine, beer, schnapps, liquors, and brandy. The nearly infinite types of sausages is mind-boggling. I have asked many people who have bicycled in other countries and while each country has its own appeal, none compare with the 50,000 of kilometers of dedicated bicycle paths and bike routes that are signed. Adding in the hiking paths, there are over 190,000 kilometers of signed bicycle and hiking tours in Germany. The several guidebook companies that compete in Germany make finding a route that fits your preferences easy, even if the choices are many. I said the people in Germany are bicycle-friendly. Many ride bicycles from barely out of diapers to well into their 80s. Seeing people on their way to and from the grocery store with a bicycle is a common sight. In the mandatory driver training that every German has to take before obtaining a driver's license, people are taught to treat bicycles the same as any other traffic on the road. They do not honk at you nor do they offer a one finger salute when they drive up behind you on a narrow road. Rather they do patiently follow at your speed until it is safe to pass (even if you are huffing and puffing slowly uphill at 5km/h). Then they pull out into the other lane leaving you plenty of space. Only once on the Mulde did I get into a tight spot from someone passing us without a clear view of oncoming traffic. Even then, I was given room, albite only a little, while the two automobiles had perhaps less than an inch between them. We seldom stop to consult our map without someone offering to help us find whatever it is that we are looking. Not that that does not happen in other countries as well, but it seems to happen more often in Germany. 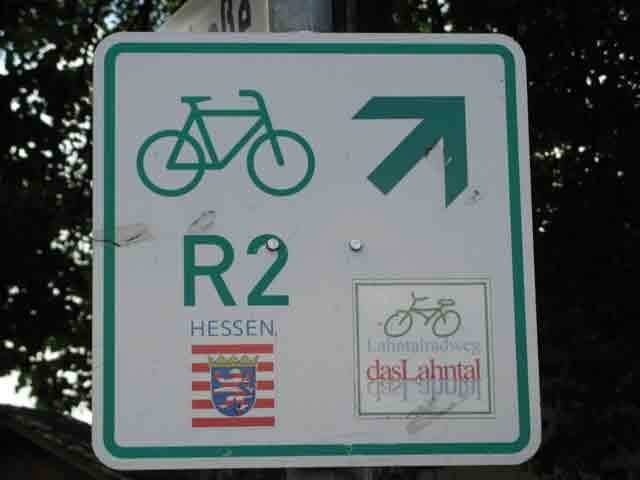 The ADFC (Allgemeiner Deutscher Fahrrad Club) which translates roughly to the General German Bicycle Club has published and maintains a list of Bett & Bike overnight accommodations that meet their rigid criteria of local and bicycle knowledge and bicycle service abilities. In fact, the ADFC in 2011 published a map of Germany with over 50,000km of long distance cycle tours a small percentage of which are on automobile roads but most of that distance is on dedicated bicycle paths. The map is called ADFC-EntdeckerKarte and can be purchased by ordering one from the publisher, ADFC, Attn: EntdeckerKarte, Postfach 10 77 47, 28077 Bremen, Germany. The telephone number from Germany is: 0180/500 34 79 (0,14 Euro/Min. from a wired telephone, but from a mobile phone the charge is max. 0,42 Euro/Min.) The phone number from outside Germany is 049+180-500-3479. The cost of the map is a flat fee of €5. Or, you can fax ADFC mentioning the EntdeckerKarte at: 049+(0) 421/346 29-32 and inquire about the cost to send it to your address wherever you live in the world. If calling from outside Germany, omit the country code and the (0). The ADFC also offers route-planning that can be searched by the level of difficulty you choose. Any good bookstore in Germany has a travel or vacation section where you can find bicycle maps and guidebooks from such providers as Esterbauer, producers of the bikeline series of guidebooks and maps. 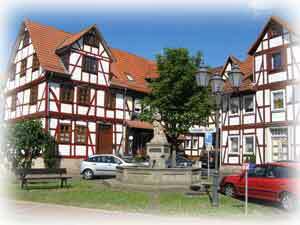 Another prolific provider of guides and maps is BVA-Bielefelder who produce Spiralo guides. The German Tourism industry and the federal train system (Deutsches Bundesbahn, or just "DB" or Die Bahn) have cooperated in making the entire country “bicycle-friendly.” The DB publishes brochures about bicycling vacations and interesting bike rides. In Germany, individuals, entire families, clubs, and sometimes entire school classes take bicycling holidays for a week or more. 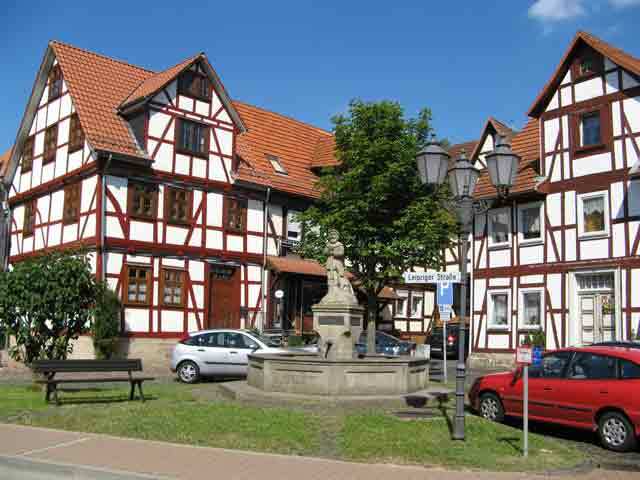 Some camp out in a Campingplatz but others use the local hotels, guesthouses (Gasthaus and Gästehaus), bed and breakfast establishments like Pensions and, our favorite, Zimmer. See our Overnight Accommodations page. Bicycling is ingrained in the German culture. According to the Grosser Fahrrad-Atlas Deutschland by Mair Geographischer Verlag, Karl von Drais invented bicycling over 175 years ago. (Of course, the first bicycle did not have pedals or a chain: you had to push it along with your feet like a scooter except that you sat on it so one could use both feet to push.) It is rare to find an adult German who did not grow up riding a bicycle and whose children, parents, and even grandparents probably still ride - if they still live. This fact makes drivers and pedestrians understanding and accommodating to bicycle riders (unlike in the USA). 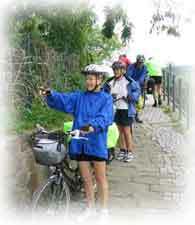 We started our bicycling in Germany in 1999. 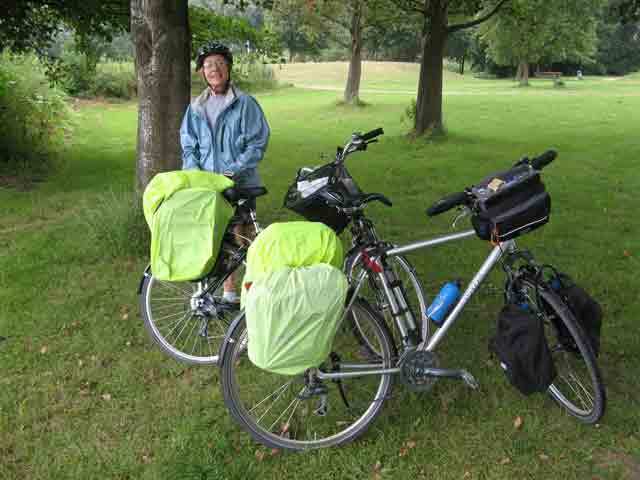 As I write this in 2013, we remark on how many more cyclists we meet on the paths. Sure the Euro is down a bit against the dollar and all of Europe is experiencing a recession but those facts alone do not account for the increase in popularity of cycle vacations. The increase is probably also due to better quality bicycles, more cycle paths, more cycle-friendly accommodations, and it is much more fun to tell your friends and neighbors how you spent your vacation cycling. The only drawback about bicycling in Germany is perhaps a slight shortage of campgrounds. 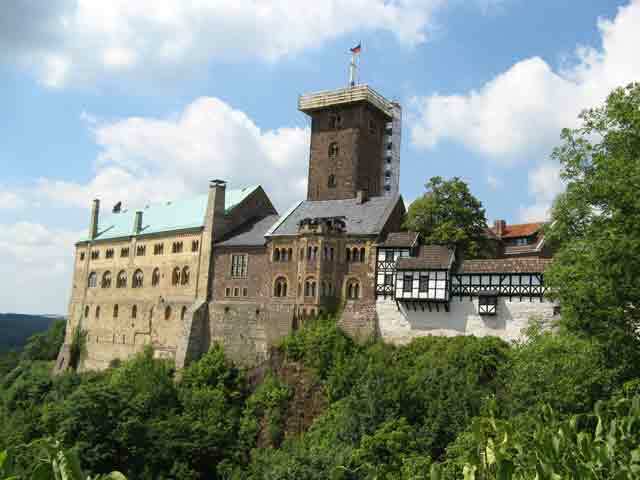 And in some areas, the castles are on top of steep hills (darn it). You can solve the campground problem by getting a good guidebook listing them. Sorry, we cannot solve the castles-on-the-hilltops problem. Send your bike by freight ahead: One more thought belongs here on the Germany page. Some of the freight forwarding firms in Germany (or around the world) will ship your bicycle to a physical address (house number, street, and city with postal code) for a fee (starts around €30). One such firm is Hermes Versand Service. If you are traveling by Deutsche Bahn (rail), you can organize sending your bicycle by freight from house to house at least 2 days prior to your planned arrival at your destination by calling DB's Hotline 0180-5-99-66-33 (the fee for this hotline is €0.14/minute from a landline, €0.42/minute from a mobile phone). One can also Google "Hermes Verstand." It is not inexpensive to ship a bicycle within Germany but it is convenient. You can pack your bike for shipment or Hermes will pack it for you for an additional €6 - €7 per bicycle. I think I could go on and on until the cows come home. But I will stop here having some comfort that I have made the case for bicycling in Germany. For more about riding in Germany, check out the following pages: What to Expect, Tim's Tips, and Bicycle Theft in Germany.